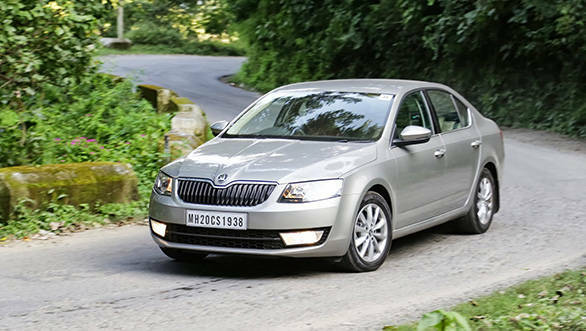 The third gen Octavia passes the first test with flying colours -- it looks great but also unmistakably Skoda. 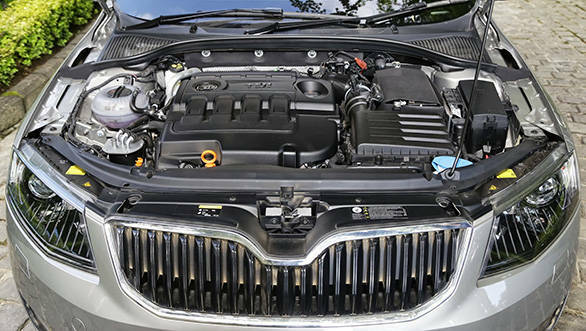 The face is the most striking part of the design with Skoda's family grille, new logo and trademark bulge on the bonnet. The LED daytime running lamps in the headlamps capture attention, but you only get them on the top Elegance variant  the mid spec Ambition gets halogen DRLs, while you're going to have to turn on your parking lamps if you've got an entry level Active since it doesn't have any form of day time lighting. The headlamps feature powerful projector bulbs and the overall face is handsome and striking. You wouldn't be wrong to draw parallels with the previous gen A4 at first glance. The headlamps have a similar shape while the solid side profile with its strong shoulder line echoes Audi's design ethos. The rear feels most familiar and could easily be mistaken for a Rapid thanks to the similar C-shaped lamps. It even has the same kinks in the metal work around the number plate. A diffuser completes the rear bumper and it completely hides the downturned exhaust pipes. It's interesting to note that the only badging on the rear is "Skoda" and "Octavia". There's no mention of engine variants or trim level and it gives the car a sense of anonymity. It's nice to keep people guessing what you're packing under the hood. All three variants come with 16-inch alloys but the base variant gets a different design. Perhaps the only other visual give away is the small lip spoiler on the rear that indicates you're driving the most powerful version  the 1.8 TSI. The insides are subtle but luxurious. There's plenty of soft feel material all around with generous and usable stowage areas all over the cabin. 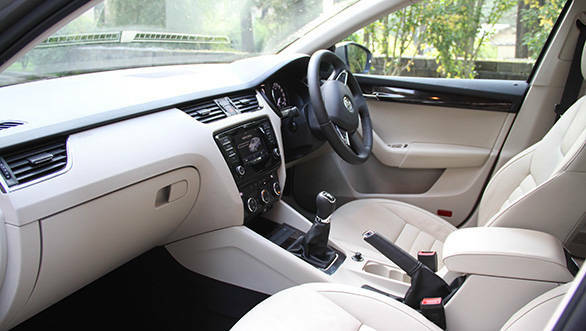 Light coloured leather perfectly complements the darker tones of the dashboard, and there's some great looking wood and metal trim on the door pads and centre console. The massive sun roof shuts automatically when it detects rain. The seats are large and supportive, but also have a welcome softness that you just sink into. The top-end variant gets 12-way electrically adjustable seats for the driver as well as three programmable memory positions. The cabin is generously spacious with plenty of knee room at the rear and a massive 590-litre boot that's very accessible thanks to the notchback design. The downside is the very high transmission tunnel that's going to make things uncomfortable for the fifth passenger. There's a dual zone climate control setup at the front, while the rear gets a central aircon vent but with a weaker blast than from the units up front. At the heart of the centre console lays a 5.8-inch touch screen display. It reacts very well to inputs and is much more user friendly than some of the units we've seen in the past. The display offers plenty of information like trip details, fuel consumption and more. Sound quality is great but the audio system comes with a 'media port', which means you're going to have to buy an extra adapter for USB, AUX and iPod connectivity. The four spoke steering wheel feels great in the hands and comes with audio controls. Everything feels well put together and build quality is impressive, but the new Octavia lacks the first car's legendary feeling of solidity. The doors don't shut with the same thud and it quite doesn't have that famous tank like impervious feel. 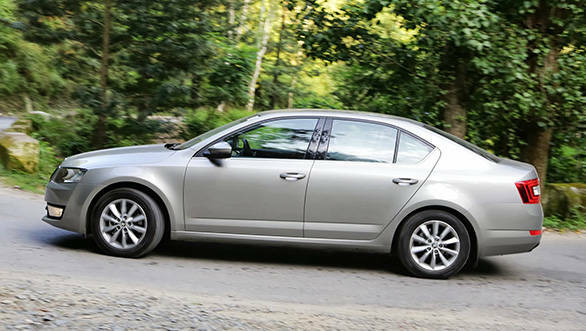 Skoda offers the Octavia with a choice of three powertrain and three gearboxes. The most affordable of the lot will be powered by a turbocharged 1.4-litre TSI petrol engine. This is the same engine you'd find under the hood of a VW Jetta, but where it feels just about adequate in the VW it's quite entertaining in the Skoda. That's because it only produces 122PS in the Jetta, but is bumped up to 140PS in the lighter Octavia. You can only have it with a six-speed manual, but apart from a slight notchiness when shifting into second the gearbox is a pleasure to use. The engine lags till about 1400rpm after which it pulls in a strong, linear fashion all the way to the 6500rpm redline. There's a highly impressive 250Nm for such a small engine. Torque peaks between 1500 and 3500rpm but the engine lags below that. 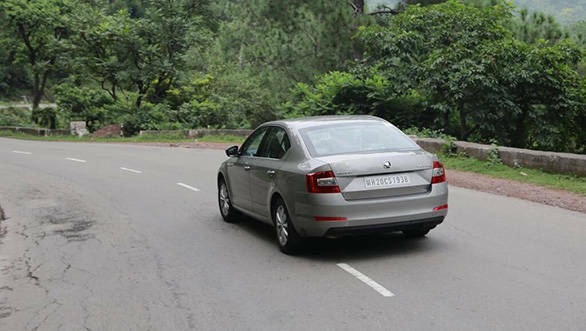 It gets rather cumbersome when climbing steep mountain roads like the ones we were on around Shimla, but you can expect good drivability in flatter driving conditions. The second engine on offer is going to account for the most sales  the 2.0-litre TDI diesel. This is the only engine that you can have with a six-speed manual or a six-speed DSG automatic. It generates 3PS more power than earlier for a total of 143PS at 4000rpm and 320Nm between 1750 and 3000rpm. Skoda has ditched the lower powered 110PS version. The engine feels just the same as before with a lovely free revving feel, and a willingness to spin to its 5000rpm redline with surprising ease for a diesel. It's a smooth engine but it can get quite vocal when the revs cross 2000rpm. We didn't get to spend time in the manual version but the automatic is the same as before and offers quick, smooth changes. The most exciting car of the lot is the 1.8-litre TSI. The turbo petrol gets a significant 20PS boost and it now produces 180PS of power and 250Nm of max torque. That's the same amount of torque that the 1.4 manages to make but the 1.8 peaks at a lower 1250-5000rpm. It's ironic that the diesel makes its peak torque highest in the rev range and for the shortest period, such is the awesomeness of modern turbo petrols. While the 1.4 is a pleasantly entertaining car to drive, the bigger petrol is an absolute hoot. It pulls cleanly from anywhere in the rev range and the 7-speed DSG makes sure you always have the right cog selected. It's also much nicer to drive because it's so much more refined and quieter than the smaller petrol. While you can drive the car sedately all day long, performance is explosive when you ask for it. Sadly neither of the automatics offer paddle shifters and you really miss it in the 1.8. Nevertheless, this will easily be the one of the most entertaining sub Rs 20-lakh sedans on offer today. 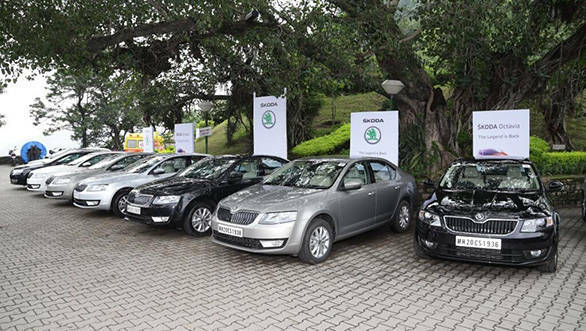 Skoda claims a slight increase in mileage across all variants thanks to a lower kerb weight (down by up to 102kg). Now that's especially impressive considering that the car has grown in length, width and wheelbase. Being based on the VW group's MQB platform has not only allowed Skoda to increase size and wheelbase for that extra space but also use plenty of high strength steels for a lower kerb weight. It's now bigger than a Jetta but weighs 65kg less than the equivalent diesel automatic. The Octavia is 9mm lower than the Laura but the 155mm ground clearance wasn't a bother on the rough roads we encountered. 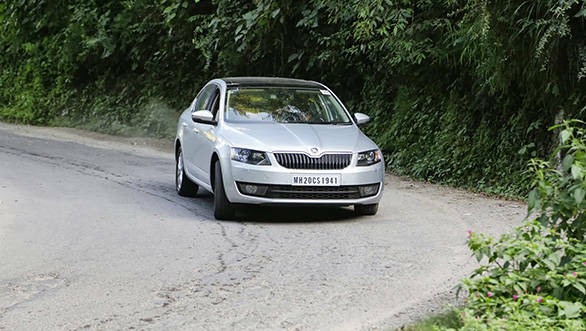 The Octavia rides very well through broken and rutted roads and cleanly absorbs all but the most severe of potholes. The ride was really impressive, but there's unfortunately quite a bit of suspension noise that seeps into the cabin that tends to slow you down. The Octavia uses MacPherson struts at the front and a torsion beam set up at the rear. The set up is remarkable and the car shrinks around the driver and feels composed in all situations. The chassis has a taut but compliant feel that gives you a great ride/handling balance. The perfectly weighted electrically assisted steering makes the car very easy to drive. The steering, while very direct and precise, has almost no feedback from the front two wheels and that tends to dilute the experience. Skoda's new policy is that more powerful versions will get fully independent rear suspension and the difference is discernible in the 1.8-litre TSI. The car with its independent rear setup feels just a little bit tauter and there's better connect from the rear. Another benefit is less noise from the rear suspension as the lower variants produces an irritating creaking noise as the weight transfers to the rear when you roll to a stop. the list goes on. That's seriously impressive. If the company can offer all of that for a price that we believe will range from Rs 11.5 -16 lakh, ex-Mumbai, they have a winner on their hands. It makes the most sense to choose the Ambient trim as it offers most of the features above but will cost significantly less than the top-end Elegance. Skoda, however, acknowledges that their shoddy service reputation needs significant work, and they are focussing their energies on drastically improving the customer experience. There's no doubting the Octavia is a winner but just how well is it going to do? That depends on just how well Skoda fixes their after sales experience.